Banyan Tree Ras Al Khaimah Beach Resort Hotel is a sun-kissed shores of powdery sands and cool azure waters of the Arabian Gulf, rush to greet guests at the Banyan Tree Ras Al Khaimah Beach. Reposed on the Al Jazirah Al Hamra in Ras Al Khaimah, this exclusive all-pool villa resort possesses all the elements of an idyllic beach retreat made for the world-weary traveller. 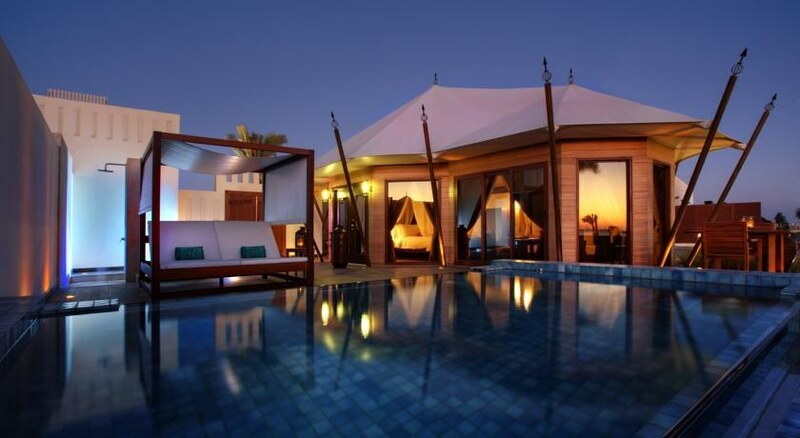 Reminiscent of a Bedouin-style dwelling, the expansive 170 sqm tented Beachfront Pool Villa invites the guests to camp under its beautiful canopied ceilings. Spend mornings lounging during the day on bed with a quiet read. Cool off with a refreshing afternoon dip in oneâ? 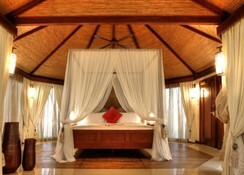 ?s personal plunge pool or seek respite in elevated beach cabana. As the sun dips, round off a romantic in-villa dinner with a drink under the stars and the lullaby of gentle waves lapping ashore. 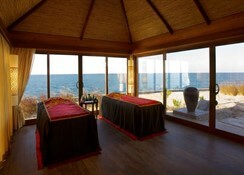 Indulge the senses with spa therapies at the award-winning Banyan Tree Spa and experience a revival in body and soul. Romance is on the menu with intimate dining themes for couples. Sourcing the freshest food and produce from the region, talented chefs offer a sophisticated experience drawn from the very best of Asian and European flavours. Replete with a host of sophisticated recreational and leisure facilities, Banyan Tree Ras Al Khaimah Beach is the ultimate destination for guests seeking physical and spiritual rejuvenation. All guests can enjoy a range of activities including Morning Yoga, Kayaking (extra charge)Early Jog and Sunset on the Beach. 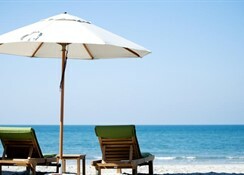 The resort is 70 km away- 45-minute drive- from Dubai International airport and 25 km away- 20-minute drive from the vibrant Ras Al Khaimah city center.Surrounded by the waters of the Arabian Gulf- the 32 private tented villas sit majestically on the sandy coastline like a mirage in the desert. The resort is situated on its own private beach peninsula stretching out to sea and reached either by boat or by land.Each of the 170 square meters villas emulates the nomadic tents of the Bedouin tribe with arched tented roofs and wooden support poles. This contrasts comfortably with the contemporary neutral interiors and floor-to-ceiling windows that flood each villa with light. Personal plunge pool accompanies every villa along with a decking area and beach cabana with a day bed for the ultimate in relaxation and for basking in the sunshine.Guests can embark on a short romantic cruise and spend the late afternoon relaxing in a traditional ABRA boat that sails around the bay. A water sports centre with various activities provides a myriad of options for those seeking water based adventures.Head north on emirates road- at the end of the Emirates Road take a left turn at the roundabout. Follow the street for 5.5 meters and turn right to Al Hamra resort and Village- Follow the street for 1.5 km and turn right into Al Hamra golf club parking. Follow the hotel's signage to the jetty located at the far end of the parking. 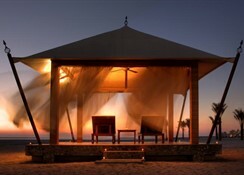 Banyan Tree Ras Al Khaimah Beach is located on a private stretch of white sand beach in Al Jazirah Al Hamra. 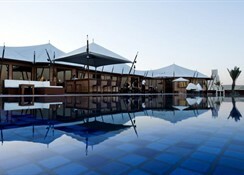 All villas feature a modern Arabian decor with private pool and beach cabana with views over the Arabian Gulf. Each accommodation is equipped with a wireless internet access, LCD TV, mini bar, tea and coffee making facilities, safe locker, sun lounger with mattress and a private bathroom with amenities. Overlooking the resort's infinity pool, the Sands bar serves an array of local and healthy international cuisine. 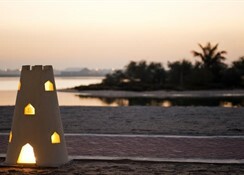 In addition, guests can also spend a restful evening sipping cocktails or fine wines while enjoying Arabic shisha. Room service is also available for private dining. Recreational facilities include snorkeling, scuba diving, fishing, outdoor swimming pool, beach volleyball, soccer and table tennis. Excursion can also be arranged at the resort. Ras Al Khaimah International Airport is 38 km away. There's a professional golf course within easy walking distance and numerous on-site water sport facilities centred on the large outdoor pool. The private beach area can be accessed in minutes and there's also a fitness centre, wellness centre, spa and massage rooms on the premises. You can join a sea-fishing trip along the coast, or indulge in scuba diving and snorkelling. Summer promotion :- Complimentary Rainforest Experience per person per say Complimentary 45 minutes ARCHERY per person per stay. The above activities are complimentary as a part of our Summer Escape Promotion if booking any villa type for minimum of 1 night. The breakfast served in the Sands Restaurant is A LA CARTE ( no buffet breakfast) Please note rates and conditions are not available to U.A.E residents. Kindly be informed the below points during the Holy Month of Ramadan - Food & Beverage outlets will remain open as usual however alcoholic beverages will only be served in the outlets after sunset - Iftar and no live entertainment/music in our bars.